We crochet because we want to, but then we sew because we have to. I wanted to take a minute to demonstrate how to sew crochet pieces together. Lately I have been really impressed how easy it some sweater and cardigan patterns have become. Designers have found a way to take a handful of rectangles or squares and turn them into beautiful wearable pieces. The only catch is you have to know how to sew crochet pieces together. So I thought I would take a moment and demonstrate how to sew crochet pieces together three different ways. In the video below I will show you how to sew the whip stitch, a running and gathering stitch and my favorite, the invisible stitch. Let’s take a look at these types of stitches. Happy 2019 check out my New Year’s Resolution for Crocheters! The first stitch to learn is the whip stitch. The whip stitch is a quick and easy way to sew crochet pieces together. You can sew pieces one on top of the other like you would on the side of a purse or side by side like the squares of a blanket. The whip stitch can be worked up quickly and easily. It is a great stitch to use when you are in a hurry or when you are sewing crochet pieces together in at area that will not be seen. Now the disadvantage to the whip stitch is that is it not the most discrete stitch. The photo above shows the whip stitch done with a contrasting color, but even worked with the same color the stitch is a bit noticeable. The next way to sew crochet pieces together is with a running stitch. The running stitch is used to sew one piece on top of another. This stitch can be used to sew pockets onto a cardigan or purse. The running stitch is a great way to add extra detail to a project by sew crochet pieces together with a contrasting color of yarn. You can see this in the photo above. 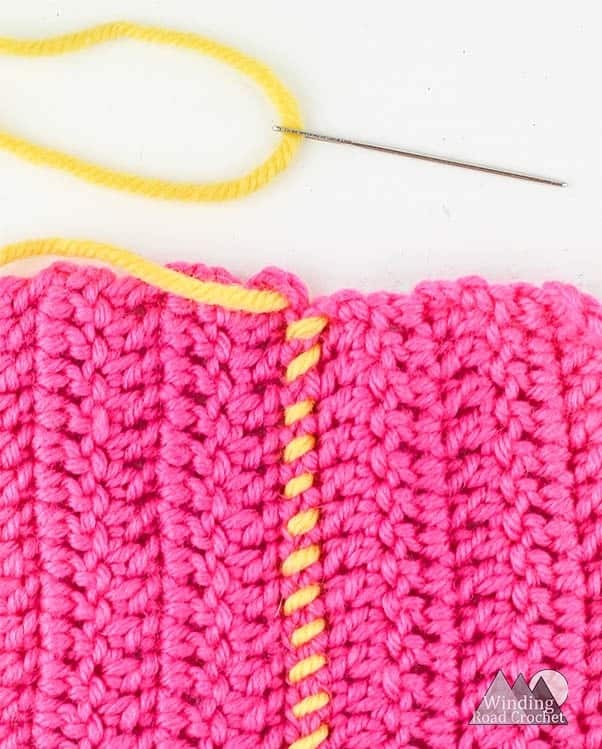 This stitch is quick and easy to do and mostly invisible when using the same color of yarn. If you use this stitch to sew two pieces together that are side by side you will have a raised area. This can look very stylish if you are trying to make the seams stand out. If you make a running stitch with long stitches, you can pull the stitch tight to create a gather. This is a great way to gather the top of a winter hat. Love to Crochet? Check out all my Free Crochet Patterns while you are here! Some of my favorites are below. The invisible stitch or blanket stitch is a wonderful way to sew crochet pieces together when they are side by side. An example of this would be sewing crochet squares together for a blanket. The invisible stitch is complete invisible on one side of the crochet fabric and almost completely invisible on the other. In the photo above you can just barely see the pink stitch marks for our working yarn and had I used the same color of yarn for sewing, the stitch would be mostly invisible. Below you can barely tell where the seam is on the other side of the crochet fabric. The Invisible stitch is my favorite way to sew crochet pieces together. Written pattern, tutorials, graphs and pdfs of How to Sew Crochet Pieces Together are copyright Windingroadcrochet.com. Please do not reprint or repost this content as your own, but please feel free to share this link with others. You can find more information on sharing my work with others in the Terms and Conditions Page.